Imagine, if you will, one hundred cast iron figures standing on a beach. All are placed at different distances up and down the shoreline; all are staring out in the same direction to the horizon, across the sea, across the sand. As time passes and the tide changes, some of the figures disappear completely beneath the waves, others are waist deep and the ones furthermost up the sand stay dry. Antony Gormley’s Another Place on Crosby Beach is a fine example of a public art installation disrupting the eye space of place and exploring the use of fantasy. However, these figures are not alone on the beach. Less than a kilometre north, beyond the sea-side café and the small public toilets, beyond the final cast iron figure and the car park, is another, accidental and largely unnoticed art installation. 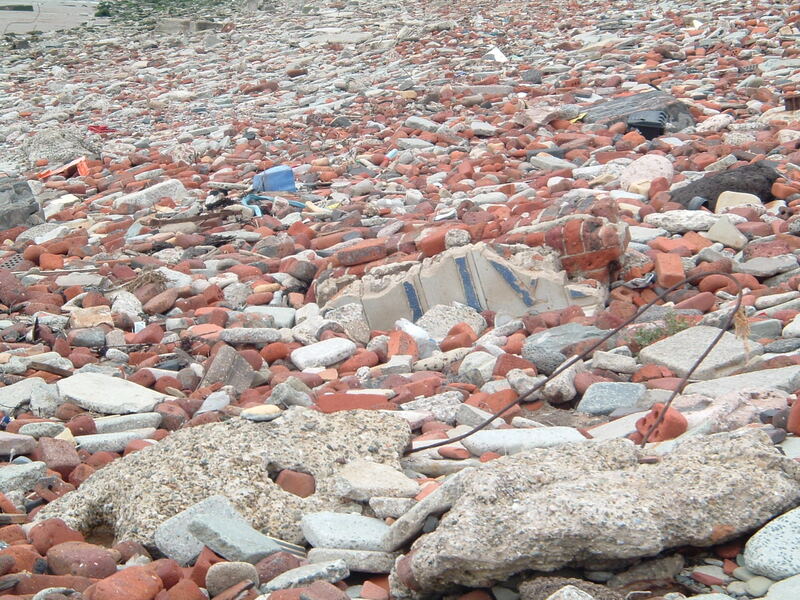 For the sea defences at this point on the beach are made from smashed up buildings – old mills and industrial factories. Fragments of a long gone time are shattered by the incoming tide. 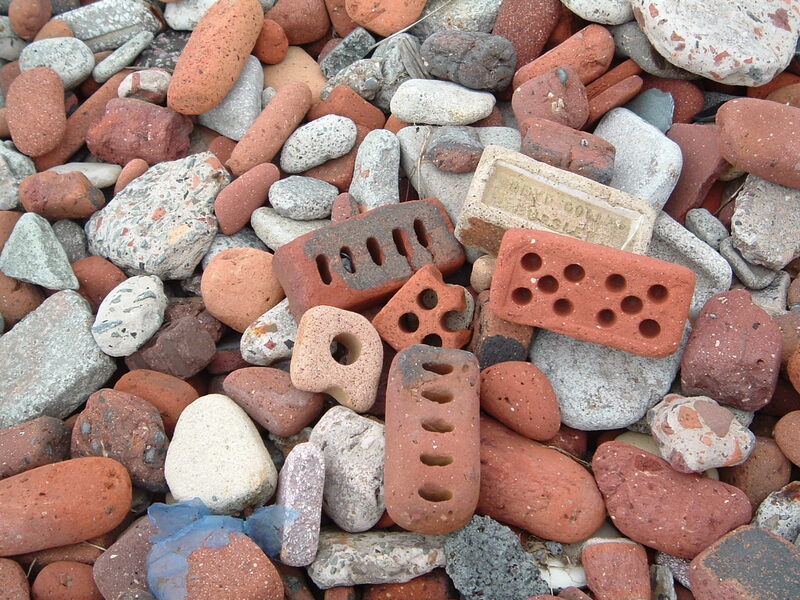 Walls, bricks and tiled signs, chimneys and windows and doorways, lay layer upon layer on the beach, their original usage long forgotten. Their very existence now, almost unnoticed. Yet this haunting of the beach by a lost industry, by ruined buildings has itself turned into something very beautiful, for these bricks are now worn and smoothed by the waves’ coming and going. 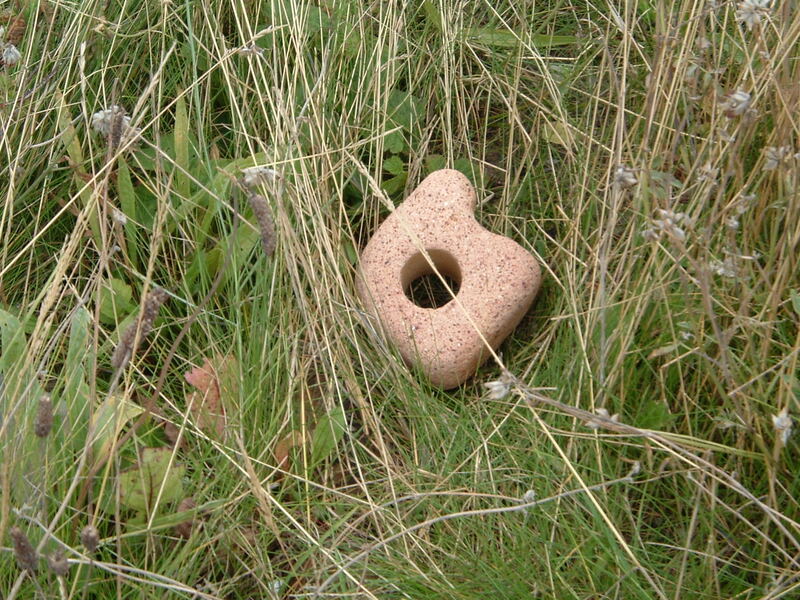 Each stone, pebble and brick curved, like a fine Barbara Hepworth piece or a valuable ancient sculpture. Tiles smooth and salty and bits of chimneys lay like immense sea sculptures, a sort of nautical spewed up art gallery. Yet seemingly no one notices. No one stops and stares or photographs this curiously natural sculpting of an industrial thing. It is the cast iron figures, the beautiful solidness of the deliberate art installation that catches our eye and our imagination. We do not stop to think upon the rubble of a time gone by, we are too mystified by the gaze of the iron men. What is it they are looking at? What is it that we are looking at? The most striking feature of Gormley’s figures is their solidness. There is nothing ephemeral or phantom-like about them. They are there, unmoving and they stay there through time and tide. Yet within that stasis there is also change, for at any given time the figures which are subject to the air and the gaze of observers are also at another time subject to the movement of the waves and live a submerged life of invisibility. So these figures challenge the very notion of absence and presence. Depending upon time they are both there and not there and yet they do not move. Some have speculated that this installation is about death. Certainly there is a melancholy in unmoving figures staring at the horizon, all silent, all identical. Others have argued it is about emigration, placed as it is near a port. The comings and goings of people and things and objects. The traces. Certainly this piece deals with the notion of change, for it is not just the impact that time and tide have on the figures, but also other natural elements. The rain, the wind, snow, the sea mists that creep from the sea and wrap themselves around legs and necks. So, the cast iron figures are no longer unmarked metal, but green with oxidisation and salt, a sort of metallic fungus crawling across lips and eyes. 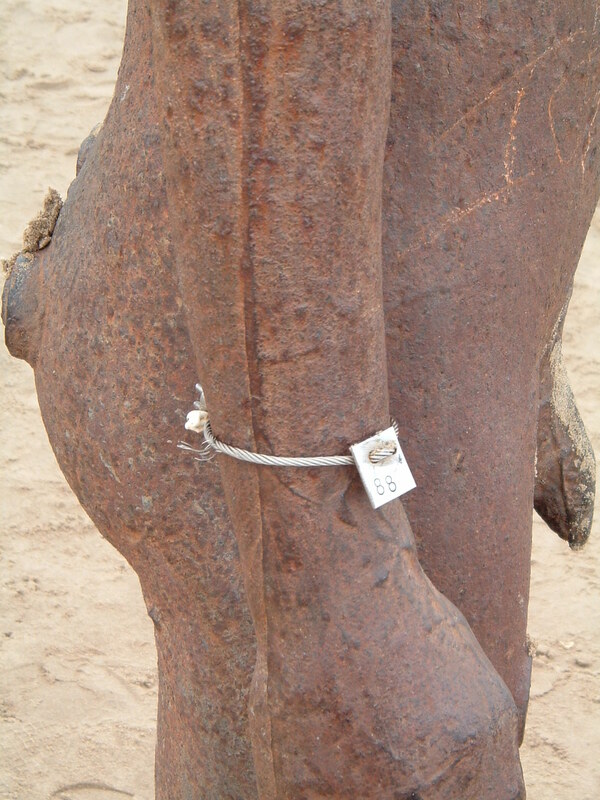 Depending upon the shift of the sand, some are buried knee-deep, others expose the solid iron plinth they are secured onto. Thus Another Place disjoints space and time. The figures snag the eye-scan of the beach, both in their vertical unexpectedness and their uncanny ability to transgress boundaries of visibility and invisibility at various times of the day. The notion of change is further highlighted by the curious tags attached to the wrist of each figure. Stamped in metal is a number, seemingly in no particular order but nevertheless imprinting a sense of individuality on these identical pieces. Again we are faced with a paradoxical quandary, of something being both alike and yet different at the same time. Another Place – both here and somewhere else. Identical figures each with their own number. Are we to prescribe individual meanings to each piece? Do the numbers have significance beyond simple labelling? Gormley himself appeared to be aware that he would have little control over the interpretation, and in a way, acknowledges that this fluidity is part of his purpose when he describes his hope that the work will act like “an acupuncture of people’s dream world” so that “each person is making it again…its actually an open space that people can make their own”. Thus, the private pocket novel of thoughts and desires is ever accessible and to a certain extent controllable. Certainly what we choose to make public is within our power. So our responses to the (physically) still yet (emotionally) moving figures on the beach, waist-high in water or submerged by the waves, are open. Yet it seems, it is this very openness that creates the disturbance of place, for people must employ fantasy if the figures are to mean anything at all. For those who fail to do this, the figures are a nuisance, a health and safety issue – people may mistake them for drowning figures and drown themselves trying to save them. Yet a mere cursory glance is enough to indicate that these solid and unmoving figures are not human. They have no body and they are not even intended to represent a body “I have been interested in asking what is the nature of the space a human being inhabits. 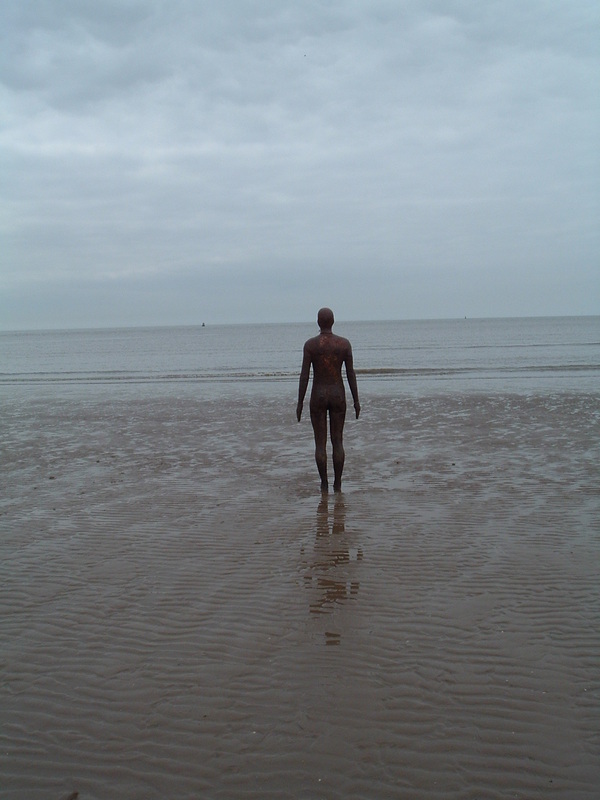 What I try to show is the space where the body was, not to represent the body itself.” (Gormley). So although the figures are casts of the artists own body, it is a body that is no longer there. It is a melancholic shell left, an absence filling the space, an absence replicating itself along the beach. More interestingly it is a solid absence that becomes animated through imagination. 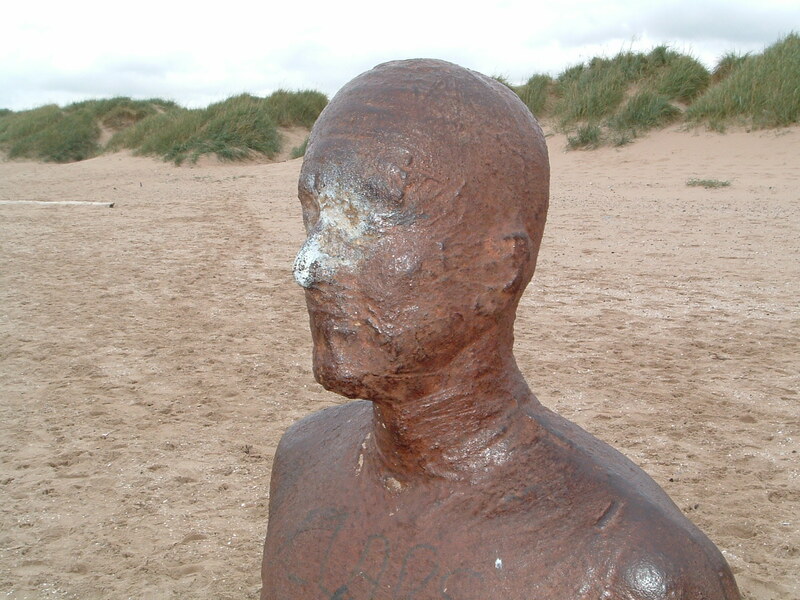 People visiting the statues stand next to them and stare out to sea following their gaze. What is it that they are looking for? Further down the beach there are other questions to be asked. What is this? What was this? A messy pile of rubble half grown over with sandy reeds and beach grasses. Where did it come from? What was it used for? How old is it? We can tell it was a building once because the bricks are still there. Here are the names surviving from the brick-makers, Liverpool, Southport, the long dead industrial north sheds its grainy remains on the beach. A smashed up name is tiled into the brick. The very names and places and people who worked in these buildings haunt the beach. Where are they now? What happened to them? 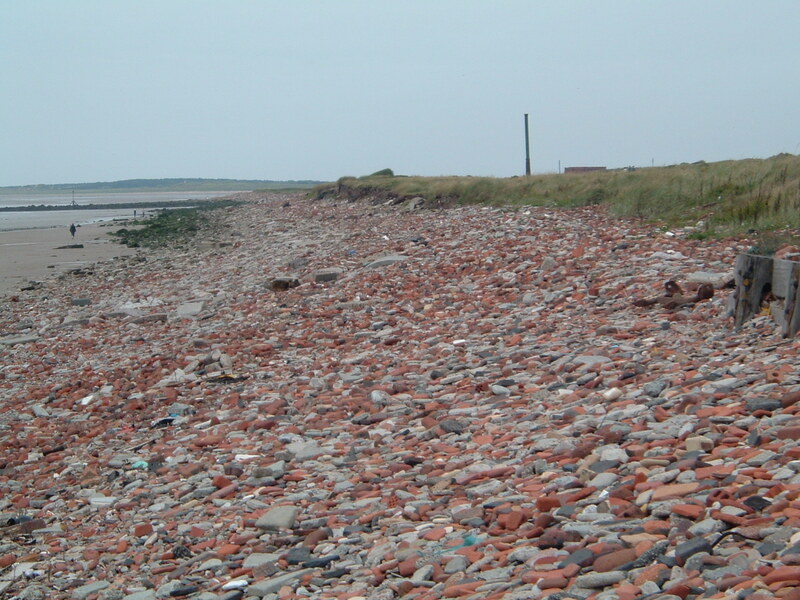 To understand a ghostly story like this, is to understand how the past can be seized in an instant (Avery 1997), how a pile of rubble on a beach can blast through time and make us question that which is both there and not there, both visible and invisible. The wavey boundaries of time and space! Industrial ruins according to Tim Edensor have long symbolised the fear that civilisations eventually crumble and that industrial ruination engenders a post-industrial nostalgia. In industrial ruins, the gothic mingles the living (plants, insects, birds) with the dead, the disorder mocks the past production and progress and strict time keeping of the managers. Fragments of ordered space from an ordered time tumble into disuse and change their context. Yet here on Crosby Beach, we do not have ruined buildings, but buildings that have been deliberately smashed to pieces, a wrecking ball through time and space that leaves dust, bricks and a salty decay. The industrial north gone out, like the tide. No longer housing the rush and bustle of industry, the shattered bricks now serve a different purpose defending the land from the sea. The bricks and chimneys are portable ruins that are not only changed themselves but bring change also. The beach space awash with sand and shells is suddenly invaded by a mass of ruined factories, an accidental art installation at odds with the iron figures carefully placed at intervals along the beach. If the silent melancholy of the iron men staring at the horizon is haunting, then the smash and crumble of these once busy buildings deafens the beach with their silence. In the dune grasses the sand hoppers skip and jump. The pom-pom plants and sharp blades flatten with the sea wind. Gravel is dragged in and out in a shingle boom on the tide. The accidental art of ruined factories lies nestled in dock leaf and spiky beach grass. Curved and smooth, honed and grainy, it sits in its curious unnatural naturalness. The traces seep into the grasses, into the beach. The memories are picked up and towed away by the tide. They follow peoples’ gazes and thoughts. They follow peoples’ lives out of the port and across the sea. Meaning leaks into the beach. The port clanks. The horizons dip. A lone gull answers itself far out on the receding tide.